On the way to pick up my son from school earlier this week, my thoughts wandered to various struggles in my life. I began to dwell on how incredibly joyful Michael and I would be if such-and-such would happen. And oh-so-quickly the heavy sadness and discouragement of spiritual desolation started creeping over me. Just like that, my intense moment of sadness was over, broken by the stern work of my conscience and the comic relief that three-year-olds always bring to things. Christian joy doesn’t come from moments when everything is going well. Christian joy is a way of thinking and living day-to-day. It comes from being rooted in God. 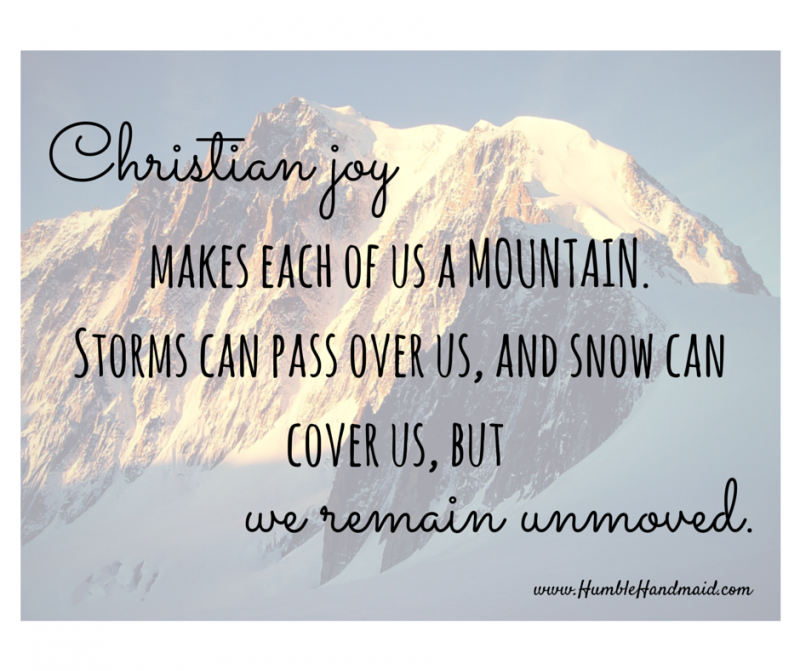 Christian joy makes each of us a mountain. Storms can pass over us, and snow can cover us, but we remain unmoved. I know why the thought of joy came to me. Joy and also the virtue of contentment have been on my mind for a while now. That morning, I had read most of a little book called Finding True Happiness, a compilation of writings by Fulton Sheen. My mini moment of grace that afternoon was exactly this: the “hard, stern work” of a well-formed conscience speaking truth to my heart in a moment of temptation. As my emotions were rising, my mind through grace helped me to zoom out and view my life once again in the light of eternity. God’s ways are so far above our ways. Amen. The mountain photograph is by Simon Steinberger, via Pixabay. So awesome. I am a Divine Mercy fan, too. :) I pray the Chaplet of Divine Mercy closing prayer every day (I keep an alarm on my phone) and that has been A ROCK for me spiritually.